Each year the National Bible Bee Competition hosts 360 of the top contestants from around the nation, who compete for over $100,000 in prize money in a heart-grabbing competition. These contestants participated in the Summer Study which, in 2017, focused on God as our Creator in Genesis 1-3 and included the memorization of related passages. For the National Bible Bee Competition, contestants receive additional study and memory passages where they apply the tools they learned over the summer to their own study. Now, the 2017 National Bible Bee Competition is available to view on Facebook Live. 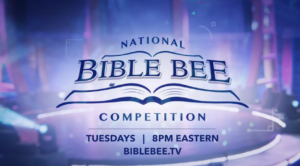 Each week, starting April 24 at 8 pm Eastern, you will be able to watch the contest that highlights and honors the Word of God on the National Bible Bee Facebook page. The show features the top 45 semi-finalists from around the nation who memorized between 600 to 950 verses as they compete in this fast-paced, exciting event. Witness the proclamation of God’s Word here. Like National Bible Bee on Facebook to view the weekly show each Tuesday night at 8 pm Eastern. Follow the page and turn on notifications to be reminded when the show goes live each week.